From Goodreads ~ Steve Jenkins and Derek Walter had their lives turned upside down when they adopted their pig-daughter, Esther - the so-called micro pig who turned out to be a full-sized commercial pig growing to a whopping 600 pounds - as they describe in their bestselling memoir, "Esther the Wonder Pig". 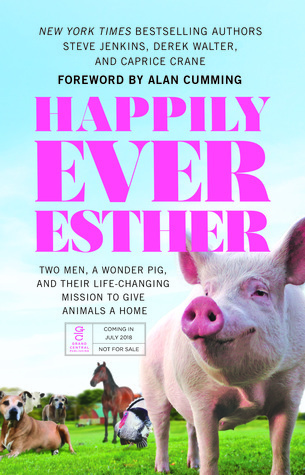 The book ends with them moving to a new farm, and starting a new wonderful life where they will live on the Happily Ever Esther Farm Sanctuary to care for other animals and just live happily ever after. People often think about giving it all up and just moving to a farm. In theory, it sure does sound great. But as Derek and Steve quickly realized, the realities of being a farmer - especially when you have never lived on a farm let alone outside of the city - can be frantic, crazy and even insane. Not only are they adjusting to farm life and dutifully taking care of their pig-daughter Esther (who by the way lives in the master bedroom of their house) but before they knew it their sanctuary grew to as many as 42 animals, including pigs, sheep, goats, rabbits, chickens, cows, roosters, a peacock, a duck, a horse, a donkey, and a barn cat named Willma Ferrell. Steve received a call from an old friend ... she had a mini pig that she was trying to find a home for because she couldn't keep her. Steve said he'd take the pig and he and his partner, Derek, named her Esther. Then they discovered that Esther wasn't a six month old "mini" pig at all ... she was, in fact, a six week old commercial pig, which means she should have been destined to be raised and butchered. Esther grew from being the size of a sneaker to over 650 pounds! They tried to raise her as long as they could in their house in Georgetown, just outside of Toronto. They eventually bought a farm about 45km west of Toronto and opened the Happily Ever Esther Farm Sanctuary and take in animals that need homes. This is the story of them starting this sanctuary. I had read Esther the Wonder Pig in 2016 and enjoyed it. Reading about the sanctuary, I wanted to go and have been twice (I was just there in July with my friend, Trish*) ... I look forward to going again next summer. Plus my friend, Christine*, volunteers there on a regular basis and I like seeing the pictures she posts of her days there on Facebook. I liked this book. 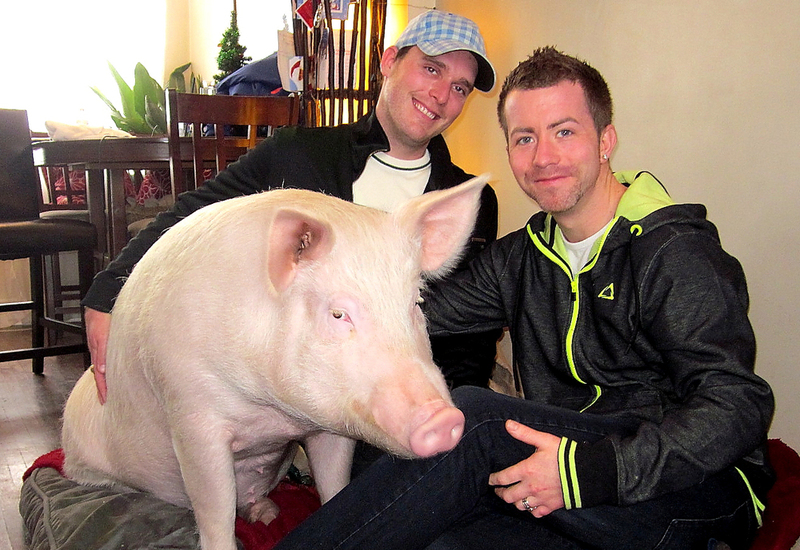 It was interesting to read how adopting what they thought was a mini pig had changed Steve and Derek's life so much. They became vegan (they were cooking bacon for breakfast one morning and suddenly connected where it came from ... a pig similar to their pig-daughter, Esther), gave up their jobs, sold their house, bought a farm, started the sanctuary and became activists. Since I've been to the sanctuary, I could picture the place and the animals they spoke about. It wasn't easy starting the sanctuary. The farm needed a lot of work and they did a lot of the manual work themselves, figuring it out as they went along. They now have a great team of volunteers behind them. People assume they will take every animal that needs a home and unfortunately they can't. There are "Esther-approved" recipes at the end of the book along with pictures. * I'm not vegan and Trish and Christine are.